Maybe Coachella (a.k.a. Coachella Valley Music and Arts Festival) isn’t for you. Maybe you’ve outgrown it. Or maybe circumstances have you skipping it this year but the FOMO runs strong. Regardless of your appetite for attending, there’s no denying that the music festival, taking place this and next weekend in Indio, CA, is a major moment on the Western spring events calendar. However, there are plenty other events worth considering that make up for what you’re missing under the iconic Ferris wheel. The other big reason to hustle to SoCal’s Coachella Valley right now? The epic biennial outdoor art tour, featuring works from creators around the globe, is scattered throughout the desert from Palm Springs to the Salton Sea—and it is the stuff Instagram dreams were made of. You don’t have much time left to experience it firsthand, but it’s worth a quick road trip to witness the giant abstract installations in the flesh. Indie, folk, and psychedelic surf rock acts take the stage at this weekender on the grapevine-framed grounds of Gundlach Bundschu Winery. Come for the tunes, stay for the vino and wine country-approved cuisine. What’s more, you won’t find hard-partying crowds here. The laidback, family-friendly vibe makes it a fest for the rest of us. P.S. Look out for an upcoming iteration of the event in Walla Walla, a Washington State wine hotspot. 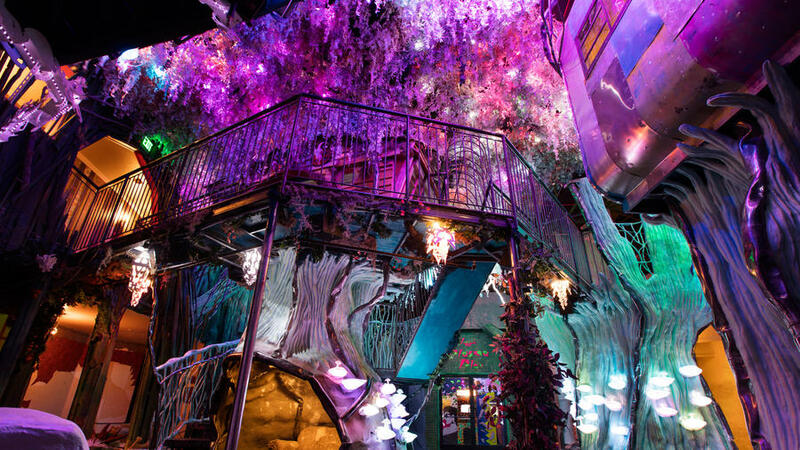 At Meow Wolf’s House of Eternal Return, a 20,000-square-foot immersive art playhouse, wander the secret passageways to encounter such trippy wonders as a giant neon-hued tree, a Flintstones-esque mastodon marimba, a teleportation fridge, and more inconceivable creations. Be sure to catch this O.G. Meow Wolf location soon before a new Vegas outpost opens in December of this year as well as one in Denver in 2020. From flower crowns to fanny packs (to the controversial headdresses), the fashions gracing Coachella’s grounds have sparked trends and debates on their stylistic merits. While you can catch the latest lewks at other events far and wide, there’s nothing like a joyous riot of rainbow-hued powders dousing a crowd to truly amp up a crowd’s aesthetic. The ancient Indian tradition of welcoming spring by tossing colors has continued into the modern day and is best experienced firsthand. Nature lovers will relish the chance to twirl amid fields of millions of tulips abloom. Scattered throughout the Skagit Valley, beholding fields awash with multiple cheery hues is a welcome burst of color in the often gray-skied Pacific Northwest. A Western bucket-list experience to be sure.